Purchase Home Loan Accomplished in 13 days! You read it right! Frontier Loan Group, Inc. (“FLG”) achieved a home loan document order in just 13 days for a recent purchase transaction. That means it only took 13 days from the date of submission to achieve a clear to close (“CTC”) notice from the lender. In case you did not know, that is fast!!! The best part was that this particular borrower had a difficult situation (multiple sources of income including disability income, owned multiple houses, etc.). This was definitely not your “cookie… cutter” transaction. Not to brag (ok, actually I am bragging), but this is not the first time we have achieved this. 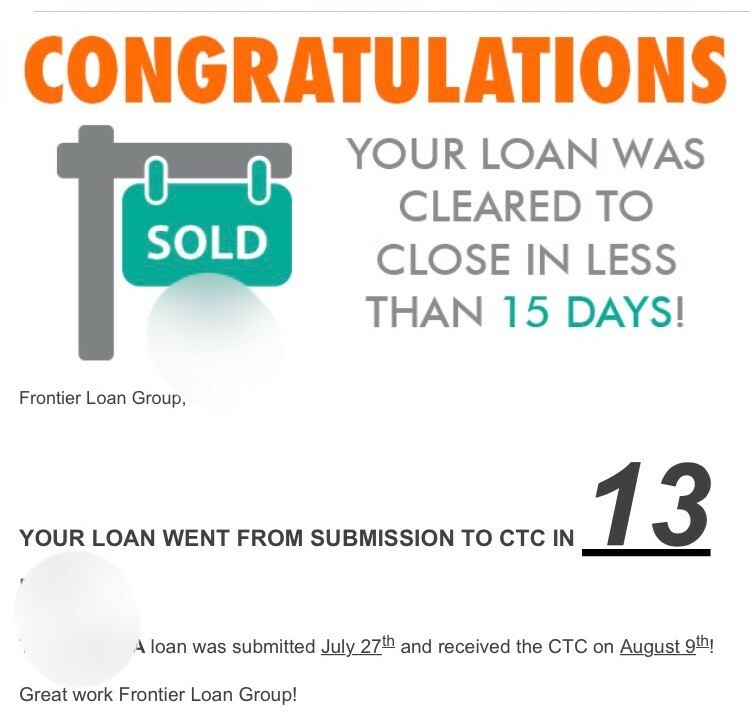 Purchase loans can be particularly difficult to get approved, however, to get a purchase home loan not only approved but moved to CTC in 13 days is remarkable. CTC means that the loan has completed underwriting and all conditions have been supplied and signed off by the underwriter. Once a lender has issued a CTC loan documents can be issued. The home loan process can be grueling for some people. Lenders have multiple sets of underwriters that review these files and each underwriter can question something and issue a condition. At times it feels like I am playing tennis against the lender batting back all of the tennis balls the lender is hitting towards me. However, I am good at tennis! As I mentioned, this particular borrower did not have an easy file. The key to success is to review the file as if I were an underwriter. Prior to submission I attempt to find every potential issue that I think an underwriter might question. Once identified, I can prepare for these ahead of time. I tell all of my clients that buying a home is not easy. It almost feels like the lender’s underwriters are doing everything that they can to kill the file. For example, this particular borrower had a w-2 job, self-employment income, rental income from multiple rental properties, military income as a reservist and disability income for his wife. In other words, there was a lot for the lender’s underwriters to review. When self-employed income or rental properties are used the lender’s underwriters will scour the tax returns looking for inconsistencies. Sometimes even the most qualified buyers feel like they are being drug through the mud. I tell my client that getting a purchase loan is like flying in an airplane. I tell them that there will be some turbulence along the way but I am a seasoned pilot and I will get them to their destination. The best thing they can do is sit down and fasten their seatbelts and enjoy the in-flight entertainment. The best clients are the ones that do not complain about what the lender is doing but work with me in getting whatever conditions are asked for as fast as possible. Frustration is part of the process, however, working with a broker that is experienced and ready to address issues makes the process so much easier. The reason that we were able to get to CTC in 13 days on this file is because the borrower was ready, willing and able to work with us and provide us what we needed in a timely manner. I love working with borrowers like this. If you or someone you know is considering purchasing a home in the near future please tell them to call FLG ASAP! They will thank you for doing so. For more information please call Michael Gaddis, J.D. today at 760-692-5950 or email Michael Gaddis, J.D. at Michael@FrontierLoanGroup.com. Frontier Loan Group, Inc. CA BRE #01449152 NMLS#345305 Michael Gaddis, J.D. CA BRE #01433800 NMLS#280011. For more information on Frontier Loan Group, Inc. please visit http://www.FrontierLoanGroup.com or visit Frontier Loan Group, Inc.’s YouTube page at Frontier Loan Group, Inc. YouTube. This entry was posted in Blog and tagged buying a home, california mortgage broker, carlsbad mortgage broker, clear to close, closing disclosure, conventional loan, CTC, fast loan approval, fha loan, home loan, home loan approval, home loan prequalification, home loan process, home loan scenario, how to purchase a home, loan approval, loan conditions, loan preapproval, loan problems, loan qualification, purchase loan, va loan. Bookmark the permalink.